Adin offers a collection of fine estate jewelry for online sale. Find some exclusive diamond engagement or wedding rings. 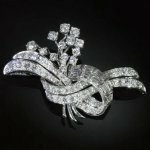 To know something about estate jewelry, one really has to dig into many (sometimes complex) factors. Some of these will be touched upon in the About estate jewelry section of the Adin website and in Adin's estate jewelry Glossary. Although we do not intend here to delve into matters in depth, the following chapters give a good idea on estate jewelry and what it's all about. Estate jewelry (also called vintage jewelry) is a term used for previously owned jewelry and for pieces of jewelry made in earlier (style-)periods and not necessarily pre-worn. It is not a dequalifying designation as many pieces of estate jewelry typically feature fine workmanship and high quality stones, as well as one-of-a-kind pieces. To be called "antique", a piece must be more than 100 years old. Estate jewelry includes many decades or eras. Each era has many different designs. These eras include Georgian, Early Victorian, Mid-Victorian, Late Victorian, Arts and Crafts era, Art Nouveau, Edwardian, Art Deco and Retro. The word "jewelry" (American spelling) or "jewellery" (British spelling) is a derivation of the word "jewel", which was anglicised from the Old French "jouel" some 800 years ago, in around the 13th century. The word "jouel" itself comes from the Latin word "jocale", meaning "plaything". Jewelry can be made out of almost every known material with the purpose to adorn nearly every part of the body. The word "estate" comes from the Anglo-French "astat" or Old French "estat" which come from the Latin "status" meaning: "state or condition". The oldest sense (circa 1200) is "rank, standing, condition" while the sense "property" is from circa 1400 and changed over the ages from "worldly prosperity" as specific application to "landed property" (usually of large extent). Its first known record in American English dates back to 1623. The meaning "collective assets of a dead person or debtor" is from around 1830. Nowadays with the prefix "estate" we mean all of the valuable things an individual owns, such as real estate, art collections, collectibles, antiques, jewelry, investments, and life insurance. Have a look in our catalogue and see the fine estate jewelry we are offering for online sale. Check out our diamond engagement rings, eternity rings, wedding bands and more. Here you will find an extensive list for the comparison of all ring sizes as used in all countries in their local units, both for new as for estate rings.